When it comes to median household income, tech powerhouses, especially in California, and suburbs of Washington, D.C., tend to dominate the top lists. Among cities with more than 65,000 population, Palo Alto ranked No. 1 in 2015 (latest data) at almost $148,000. Half of households in Palo Alto had higher income that year, half lower. Palo Alto is home to Hewlett-Packard. Stanford University is nearby, as are Google and Apple. Median household income in 2015 for select California cities: Pleasanton $138,401; San Ramon $125,832; Mountain View $120,102; Fremont $112,263, and Santa Clara $108,886. Areas near Washington, D.C., that rank high include Ellicot, MD, a so-called Census Designated Place (or CDP) rather than an incorporated city, at $113,378; Arlington, VA (also a CDP), $106,768, and Centreville, VA (ditto), $104,056. In Washington State, Kirkland, not far from Microsoft’s Redmond campus, ranked No. 1 in median household income in 2015 (chart). Bellevue was No. 2, Seattle No. 3. That Marysville came in at No. 4 is probably because it is within easy reach of Boeing’s plant at Paine Field near Everett. Auburn, Renton, Kent and Federal Way are all within easy reach of Boeing’s humming 737 factory at Renton. The east-west divide in Washington state is not subtle when it comes to household income. 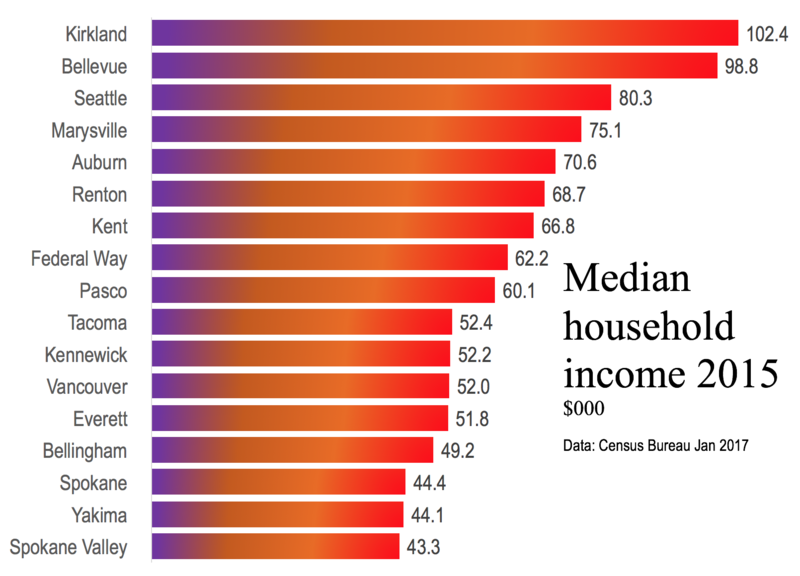 Note the relatively low household income on the east side, especially in Yakima and the Spokane area.